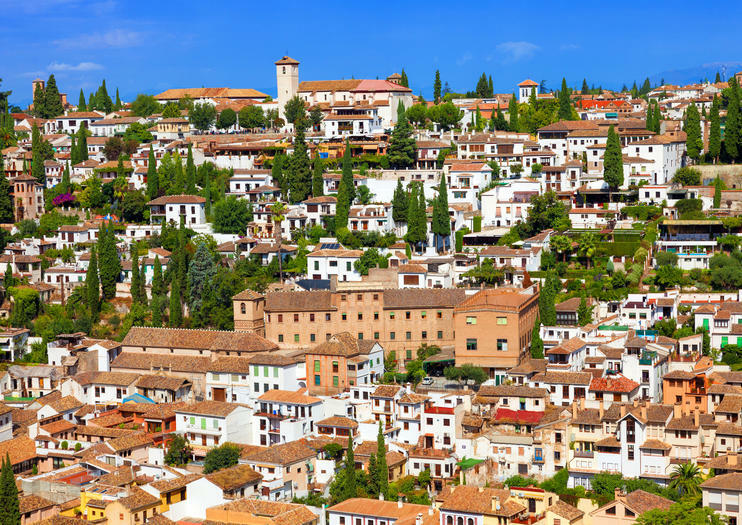 The Albaicin (also spelled Albayzin or Albaycin) is Granada's old Muslim quarter, and its steep twisting streets underscore a medieval past. Founded in 1228 by the Moors, the neighborhood is dotted with Baroque churches inside old mosques and traditional carmenes (villas). Albaicin is also known for having stellar views of the Alhambra. With its whitewashed buildings and deep-gardened mansions spilling down the hill, the UNESCO World Heritage–listed Albaicin ranks among Granada’s most picturesque neighborhoods. Most city tours will pass through, but it’s worth taking a walking tour to soak up the views and learn more about the area’s history, culture, and folklore. Some tours also include a walk through Sacromonte, the gypsy quarter known for its ties to flamenco. The views of the Alhambra from Albaicin are a must-see for first-time visitors. Don’t forget to bring your camera to take photos of this picturesque neighborhood. Wear comfortable shoes with thick soles; many alleys are cobbled. The best way to explore the Albaicin is on foot, and the Plaza Santa Ana makes a good starting point. The area has practically no parking, so it’s best to either hire a taxi or catch Buses 31 or 32, which both take a circular route around the neighborhood, from Plaza Nueva. With a range of shops and restaurants ready to welcome passersby, The Albaicin is lively throughout the day. Plan to visit in the evening for spectacular twilight views of the Alhambra. Walk the narrow, sloped streets of Calderería Nueva and Calderería Vieja, and you might feel like you’ve stepped into Northern Africa. The two streets are lined with shops, teahouses, and restaurants selling trinkets and mint tea.